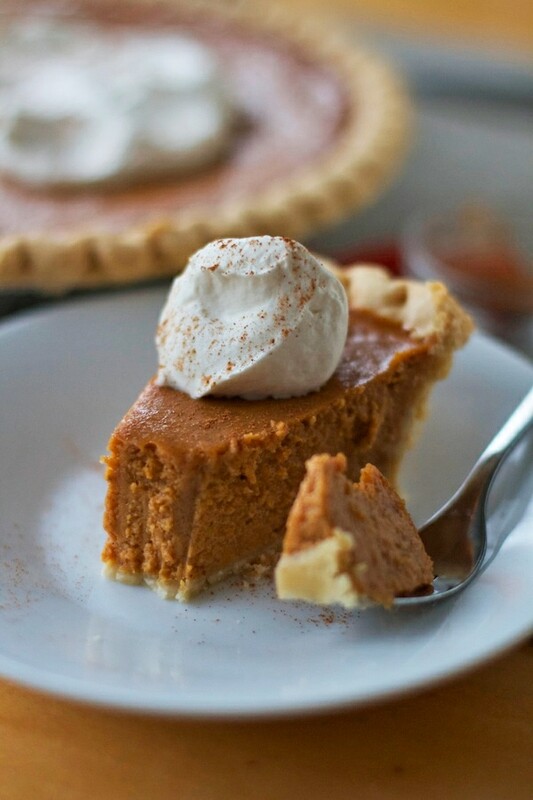 The best homemade pumpkin pie recipe! Tried and tested over and over again, with zero cracking! 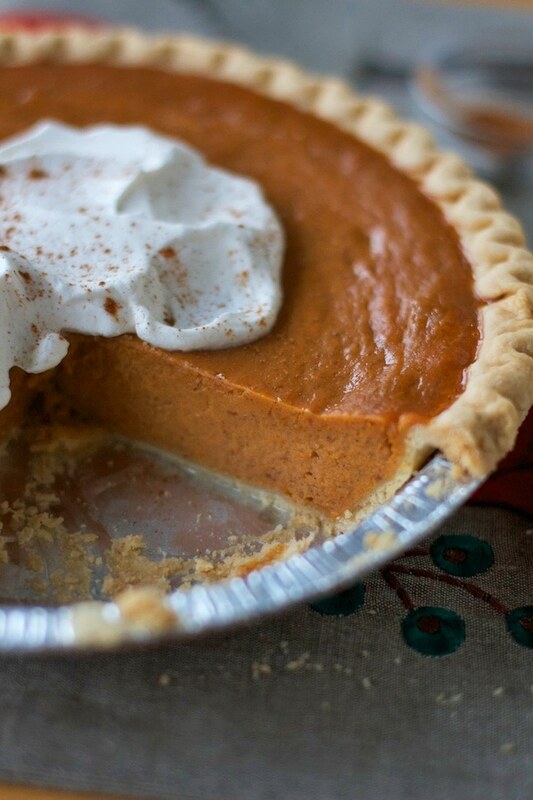 This will become your go-to pumpkin pie recipe. Thanksgiving week is upon us!! Bring on the Pumpkin Pie and Turkey!! I’m thinking about buying a deep freezer just so I can buy multiple turkeys and have a place to store them. The prices for these birds are AMAZING! I love me a good turkey, ya’ll. Everyone and their mom has a recipe for pumpkin pie that they are cracking out this week for the holidays. Since I’m still in the midst of my “oh crap, I need to make a pie to bring to this Thanksgiving feast” series, I thought I would make a crazy easy 5-ingredient pumpkin pie that is completely fool-proof. It will turn out perfectly every time and it’s a good solid fall-back recipe that everyone will be impressed by! If you have a little more time and/or are a little more organized than me, feel free to make your own pie crust. This recipe is my favorite. Regardless of whether you buy or make your crust, the rest of the pumpkin pie recipe is rock solid. It WILL NOT fail you. Maybe it’s hard to impress with pumpkin pie, but at my house, anything topped with whipped cream gets lots of oohs and ahhs. Pie Crust. You can either buy this premade OR make pie crust from scratch. If you’re going to make it from scratch, here is my favorite way to make it. (Bonus, it’s also SUPER easy). Pumpkin. Duh! You can’t make Pumpkin Pie without pumpkin. For a traditional pie, use Libby’s canned pumpkin, everyone loves Libby’s. Pumpkin Pie Spice. Find and use your favorite or make your own blend with cinnamon and nutmeg. Sweetened Condensed Milk. For super tasty and super moist pie, add sweetened condensed milk! Whipped Cream. What is pumpkin pie without being topped with whipped cream, or vanilla ice cream? They’re the perfect pair. If you love pumpkin, you’ll love my other pumpkin recipes: Pumpkin Chocolate Chip Bread, Pumpkin Pull Apart Bread, Pumpkin Cream Pie & Soft Pumpkin Sugar Cookies. If you’re making your own pumpkin pie crust, make that now. Follow directions and line your pie pan. In a large bowl, whisk pumpkin, condensed milk, eggs, cinnamon, nutmeg and salt together until uniform in color and smooth. 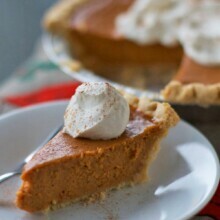 Pour pumpkin mixture into unbaked pie shell and spread evenly. Bake until center is set. Remove from oven and cool completely. 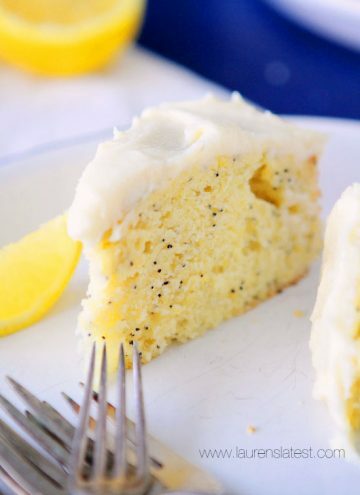 Cut into slices, top with cream and serve! Does Pumpkin Pie Need to Be Refrigerated? In short, yes. 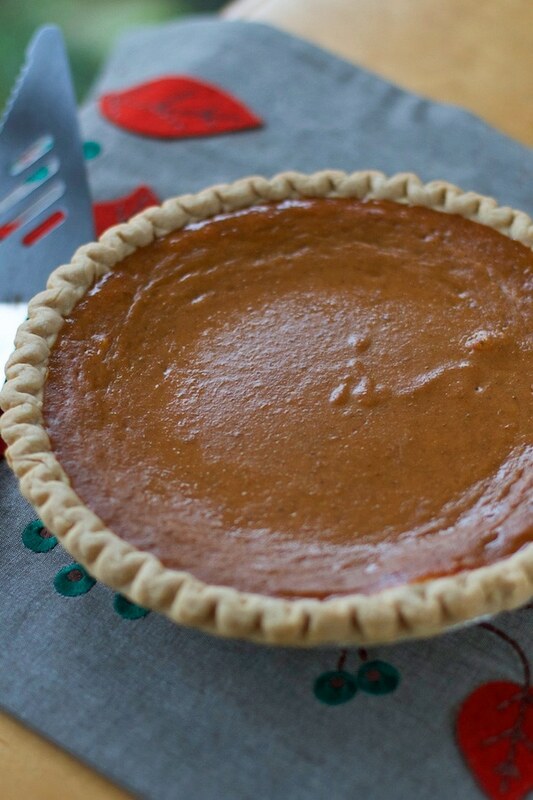 After baking and serving, refrigerate your leftover pumpkin pie to keep it bacteria free and make it last longer. This pie will last 5-7 days in the fridge, but to be honest, I usually don’t have any leftovers. It’s THAT good! Do you see? Perfectly smooth top with no cracks 🙂 and perfectly delicious! 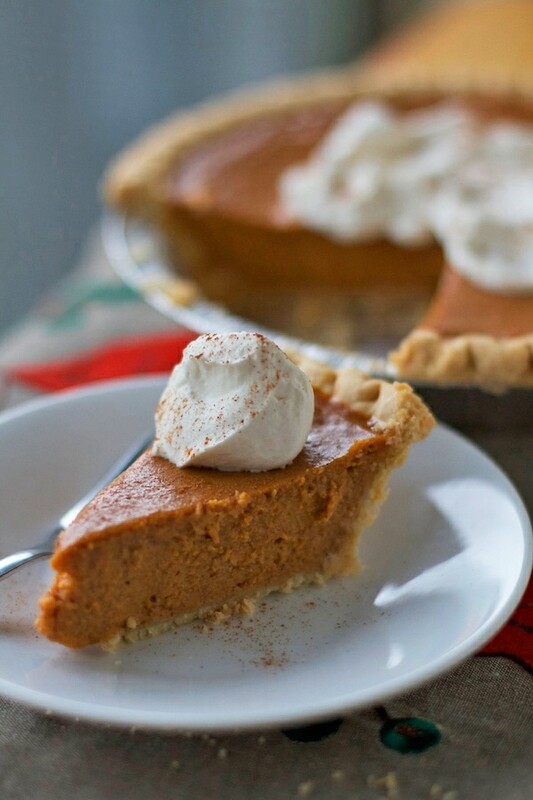 Make this pumpkin pie recipe your families tradition this Thanksgiving! Bake 40-45 minutes until center is set. Remove from oven and cool completely. Hi Lauren, I did have a recipe I was going to use but this looks so much simpler and you cannot go wrong with sweetened condensed milk! Thanks for the recipe. I would just like to say thank you to you for this wonderful recipe! I had never actually made a pumpkin pie before, and this turned out beautifully just as you said it would…just the right amount of spice, smooth texture…no cracks in the top…Perfect! I use practically the same recipe, but mine calls for brown sugar also. It is the best. I know the condensed milk is sweetened, but somehow I think I would miss the sugar, I do love seeing your recipes! Made this last night without the crust, just sprayed the dish with cooking spray and it came out wonderful! My family loved it and was so easy. Am making this for company tonight. If it’s as good as I think it will be I will never go back to the other recipe. Funny how much difference a few tweaks plus EASIER meets my priorities. Thanks! Yes! This is what I need for my teen girls to make while I’m at work today!! Came to your blog in search of a sweet potato recipe for Thanksgiving. Found pumpkin pie instead lol! I am making this today for the first time. I am so excited and can’t wait to try this tomorrow with our Thanksgiving meal. Thank you for all the great and easy recipes! Just made this for my family thanksgiving tomorrow! I have never made a pumpkin pie before, but it turned out perfect!! I’m making this today for our Thanksgiving feast tomorrow. Looks yummy! Decided to do pumpkin pie at the last minute. This is it!Thanks! Thank you! This recipe is perfect for a beginner pie-maker like myself! I’ll have to try this one! I always botch pies, but this looks pretty easy. Can’t wait! Making this right now! Thanks for the giveaway opportunity. Happy Thanksgiving! I’m making this for my family Thanksgiving on Sunday! Can’t wait to try it!! Holy crap, this looks amazing! I’ve gotta try this! Pumpkin pie is everything. I usually use the Libby’s recipe but I’m trying this this year. Pumpkin pie is my favorite! Sitting in the fridge for tomorrow!! Oh wait, I think I got it. Congrats on your blog! 8 years is something to be proud of!!! Best pumpkin pie Ive ever made! Made two for thanksgiving 2017 a huge hit with the family! You always know just what to post, especially right before the holidays! My pies are usually meh, but Im excited to bake this one tomorrow. 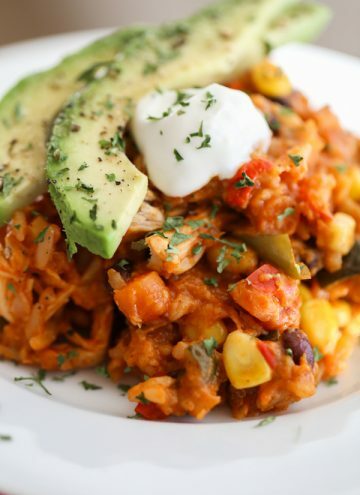 This looks so delish and easy. I’m totally going to try this for Christmas! My mom was sad that there was no pumpkin pie at the Thankgiving dinner we attended. I think I will have to make this for her! I made this for thanksgiving and let me tell you it was a hit!! So easy and delicious. I didn’t have any leftovers to eat by my self late at night lol… I will be keeping this recipe to bring again and again..
P.S. I love all your insta stories sharing your family and mom life. I can relate with 3 kids… ? I made this pie for Thanksgiving this year! 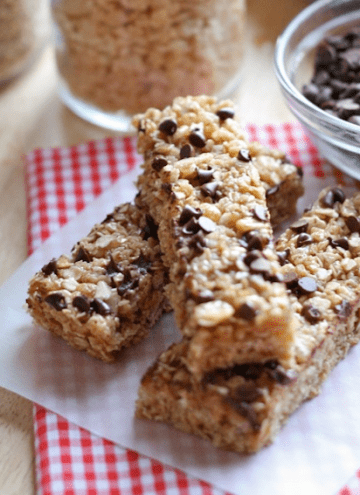 It was a big hit and so so easy to make! Hi Lauren! Leaving a comment here for the giveaway! Also because I love pumpkin pie and always looking for new recipes! I tried this and my family absolutely loved it and my in laws asked for the recipe. It was super easy to make, and best of all, it didn’t crack!! Thank you thank you!! Coming back months later to say thanks for such a great recipe! I’ve been hosting thanksgiving for 10+ years and always make “fancy ” desserts. I realized this year I’ve never made just a good plain old pumpkin pie! Like, ever! 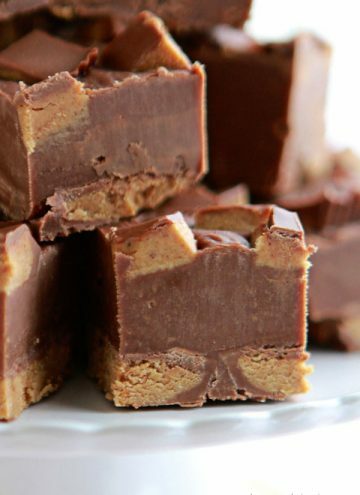 So I came right here, found this recipe, and it was delish! So much better than any pumpkin pie I’ve had. Thanks for all your great recipes!!! I made this for Thanksgiving last year and it was the best pumpkin pie I have ever made and I am known for my pies! Homemade whipped cream put it right over the top. Thanks for the recipe! Can I make this pie ahead of time and freeze it? Just mix it all up, freeze and cook right before I am ready to make it? I am trying to make as much before thanksgiving as possible since we host a minimum of 15 and up to as many as 30 on the big day. Thank you so much! Delicious!! I added a few cloves (freshly grated like the nutmeg) in with the cinnamon. I was looking for a simple pumpkin pie that tasted like the classic. Perfection.